The Visit Saint Paul Sales Team is friendly, knowledgeable, and ready to create your memorable event in Saint Paul. Jane is responsible for developing and directing the sales efforts to promote Saint Paul as a convention, meetings and sports destination. Her experienced sales team has brought many premier events to Saint Paul. 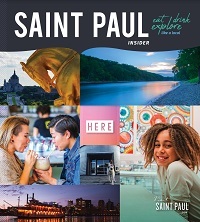 A lifelong Saint Paulite, she enjoys living and working in Saint Paul. A perfect evening for Jane is strolling through the neighborhoods and dining at one of the award-winning local restaurants with her husband Kevin. Amanda currently handles the Association market and, with over 10 years at Visit Saint Paul, she has handled all kinds of unique meetings and events! She prides herself on building strong relationships with clients—some have become dear friends. She is actively involved with Midwest Society of Association Executives and, not to mention, she’s a Certified Meeting Professional! As a mom, Amanda loves that Saint Paul is incredibly family-friendly. She and her family love going to the local museums, catching a Saints game at CHS Field, enjoying Como Zoo and attending different festivals throughout the year. Margot is responsible for booking conventions in Saint Paul from the Insurance, Tourism/Hospitality, Corporate, Financial and Sports markets. She has worked closely on events, including the NCAA Frozen Four, Red Bull Crashed Ice Championships and 2018 Super Bowl. She is a Boston Marathon finisher, and has an extensive knowledge of Saint Paul’s fantastic bike and running paths. She lives across the river with her husband Jon, and her Cavachon, Wilson. Connie supports the National Account Executives in reaching their annual goals. She coordinates client gifts and promotional items and plans a variety of meetings, tours and events. She also coordinates hosting clients in the Visit Saint Paul suite at Xcel Energy Center for Wild games and concerts. Connie loves the historic charm of downtown Saint Paul and the many beautiful parks. While off the clock, Connie enjoys time with her grandchildren and entertaining friends and family.